I know very little about the Kardashians - I don't really watch Talk Soup as much as I should, but somewhere along the line I found out Bruce Jenner is connected to the show. For fans of the show Bruce Jenner won a sports event called the Decathalon it is part of a larger event called the Olympics. For the Collector - This is an insert from 08 Goudey - I think this came out of a blaster. 2008 was the 2nd year for UD Goudey which I believe ran for 3 releases. Similar cards have been listed on ebay recently for under $2 and have not sold. It appears that UD Razor and some other manufactures have produced Jenner Auto in their recent sets. There are a handful of low-end sticker autos that have soled for under $10. $10. Recently $200 bought a pair of 2008 Allen & Ginter autos one of which was hand numbered to 10. This is our second edition of Good, Bad, Ugly, Meh or G-BUM which I see as a snapshot of what is happening on Planet Phungo. - In Semi-related news - more PEDs in MLB - just in time for opening day. hooray. -1. -FICA tax - of course my father retired last year, so I figure I am just throwing $$ in his pocket. Push. -"Life of Pi" ran a little long for me. I agree it is visually mind blowing and the story is good - but I stop short of great. push. Similar to A&G I like to toss a few oddball cards into the Phungo set. 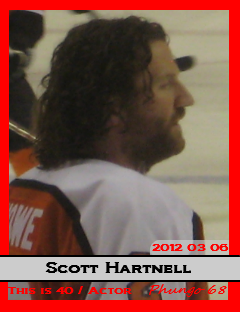 This includes other sports and some minor stars in those sports like Scott Hartnell - who fills that odd combination of enforcer with scoring ability. At press time the NHL remained in lockout mode - consequently I listed Hartnell as an actor - for at the time he basically was. Apparently he has a cameo in the Judd Apatow comedy "This is 40" which I have yet to see, but am certain I will see repeatedly on some pay cable channell this summer. Indeed today Hartnell remains an actor sort of - he basically got on the ice for about a shift - long enough to break his foot (friendly fire he was hit by a shot by a teammate) - He is out for about a month. Regardless Hockey is back, I don't care that much about the lockout and have watched bits and pieces of the Flyers so far. Hopefully they will be playing a little better by the time Hartnell returns. Team Phungo headed down to the city of Brotherly Love to take part in the Winter 2013 edition of Restaurant Week. We were very happy to have picked up a reservation at Zahav which features Modern Israeli cuisine - which features Laffa Bread and Hummus. For you out of towners Zahav is a restaurant of chef Michael Solomonov who was prominently featured on the recent Philadelphia episode of Anthony Bourdain's "The Layover"
Zahav - Smoked Sable over Challah with Poached Egg. Among the many highlights from the evenings dinner was the Smoked Sable dish above. The challah bread has a poached egg in the center. A interesting dish that even got the thumbs up from Mrs Phungo who is a little picky about her vittles that come from the sea. One of the really nice things that Zahav offers is the Salad assortment, which comes out immediately following your drink orders along with hummus and the Laffa Bread which is sort of a large fresh and steaming hot pita. It is a great idea for a busy time like restaurant week. If the dining room gets backed up for whatever reason this assures you get presented food as soon as your seated. The highlights include the twice grilled eggplant (RH side 2nd from top) the tahini beet salad (Bottom right) and the cucumber salad (top left) the remaining salads are cooked cumin carrots (bottom left), tabula (top R), and Green Beans (#3 on R). Other then the greens beans which were a bit spicy for the timid Phungo palate we enjoyed the entire salad set. The Zahav restaurant week menu is four courses. The Table course above an appetizer course from which each diner selects a pair of options. Our four dishes included the Sable at the top, fried cauliflower, Haloumi (fried ricottaota cheese), and beef cheeks pastilla (beef cheeks dough wrapped deep fried and topped by an apricot jam) . I don't think we realized it at the time, but we definitely went on the comfort food end of the scale - while I like the Haloumi, I am not sure I would pick that off the RW menu if we did it again - it is sort of glorified mozzarella sticks. Cauliflower will never be a veg I warm up to but Zahav does a great job with them. Another nice thing about RW is instead of splitting a dessert we get Two! Halva is a mousse with Chickpea Pralines - thats right Chick Peas - and it works. They give the dessert a nice crunch contrast. The 2nd dessert was Konafi - a sweet ricotta cheese and ice cream dish. Service - Double - We were seated quickly and the servers were friendly and knowledgeable about the Zahav dishes. The service did seem a bit rushed, but that may have just of been me wolfing down my meal. Atmosphere - Double - brisk and busy without being crowded and loud. Value - Double. The RW menu is 4 courses for $37.80 pp including 8% Philly food tax. Thats reasonable for a meal at a Zahav caliber venue for a meal including both apps and desserts. The 4 courses were more then enough food for a hungry Phungo. A bit of a complaint is that the drink menu doesn't include the city Liquor tax so each of your drinks goes for 10% more then the menu listing. Oddity - I want to talk about the Websites for Solomonov restaurants. Both Zahav and the much simpler styled Federal Donuts have very annoying web pages - why you need animation that runs for 2 minutes before seeing the donut menu mystifies me. For more Zahav here is a look at the Foobooz recommendations on the menu. and Craig LaBan's 2012 Review. Apparently some huge card company is coming out with baseball cards this week. Here at Phungo we are significantly smaller which makes us a bit more agile. And allows us to get cards that have players repping their new squad somewhat quicker. Not sure if Nick Swisher is in Series 1 Topps - but here he is in 2013 Phungo and he is on a Cleveland Indians card. No airbrushing for us though. I have opted for the hatless closeup. 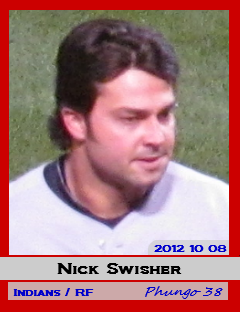 This photo was actually taken while Swisher was still with the Yankees. Swisher was walking off the field between innings and removed his cap. Perfect photo op for a free agent player. Days before Phungo '13 went to print the Cleveland Indians signed Swisher. Swisher was the darling of Moneyball and has gone on to modest success including winning a World Series as a member of the 2009 Yankees. He has had a fun career to follow and was on the Phillies rumor list this off season, but I don't think he was the proper fit. Last week the World Baseball Classic rosters were announced. 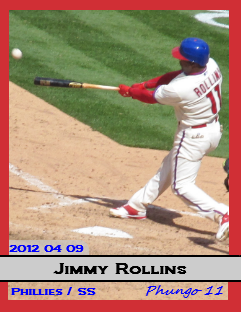 One of players selected for the USA Roster was Jimmy Rollins. This Phungo card is a bit different then any of the typical pix we have gotten. Action shots are tough to get under ideal conditions. Most games I get to are nights which cuts down on the light available. This shot is from the Phils 2012 home opener. Rollins was 2-4 that day, but right now I can't remember if this was one of the two hits. All those factors contribute to the oddity of the shot - and it ending up on a Phungo Cards. I take lots o pix, but during the game, I am typically watching the action. So for me gettng photos of the bat n ball at point of contact is pretty rare. There is a lot of awkwardness in the pix - the ball is practically off frame, Jimmy is at an odd angle almost back to the camera. But I think the shot works. There is action, color, and a star player. What more do you need out of baseball card? I plan on periodically attempting to capture some Hi and Lo-Lights from recent sports and culture on Planet Phungo in a new Feature I refer to as G-BUM - Good, Bad, Ugly, Meh. It is going to have a strong Philly Bent, but will definitely include Baseball, Sports and Trading Cards. MAssKissing of Ray Lewis. It is amazing how the NFL has rebranded Lewis - Lance Armstrong will likely be iconicized in a decade -5. Te'o Hoopla - I don't care about this story at all, except that everytime I hear a detail it makes me laugh like hell. push. -3 for the week - largely due to the sad news we got on Stan the Man and Earl Weaver. Really it was a great weekend - ran around to much on Saturday, recovered on the couch with Football on Sunday. January don't get much better than that in the northeast. Linking to one of my favorite cards and the posting from last year. Today would of been Entertainer Danny Kaye's 100th birthday. Kaye is from at least a generation before myself likely two - indeed he would have been a contemporary of my Grandparents. And I cannot tell you one think about him as an actor, singer or dancer. But, when I looked into his bio I found out something interesting. 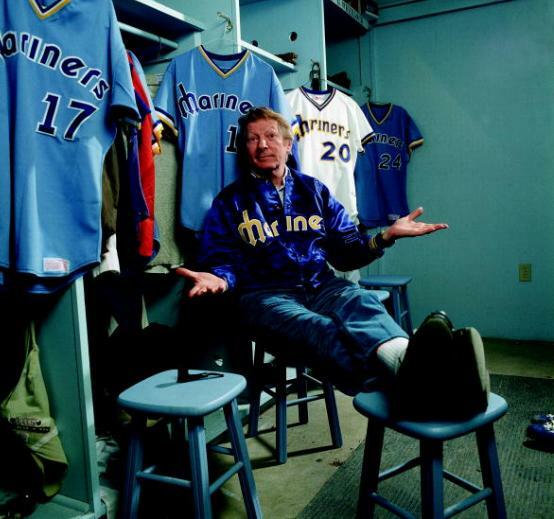 Turns out Kaye was an owner for the Seattle Mariners. Kaye co-owned the team from their inception until 1981. During those early expansion years the M's finished no better then 6th in a 7 team division. Their top players in that era included Rupert Jones, Leon Roberts, Tom Paciorek, and Floyd Bannister. Mario Mendoza was another illustrious member of those early Mariners teams. Those might not of been great teams, but it is pretty cool that Danny Kaye was an early owner of a Major League Baseball team. Happy 100th Birthday Danny Kaye. Last week the Hall of Fame didn't get any bigger. One good thing about this is that I don't have to bother moving cards over to my HoF collection. I am not sure that I have any collecting goals for 2012, but I am considering adding one Hall of Famer to my collection each month. I am looking to add cards from for each player from the years when they were active. I think I am covered for anybody that had a career that reached into the 1960s. At the Valley Forge Show last month I crossed the Hall Member of my list. As you can see, I don't get to concerned about condition. The crease would be a lot less noticeable if it wasn't across Mr Kiner's eye. The card is damaged, but looks a little better then this scan shows. Typically I will but up with some creasing but won't take on cards with writing on the front. Not as picky about the reverse. Ralph Kiner didn't get into the Hall on his first ballot or the 2nd or the 3rd. In fact Kiner appeared on the ballot in 1960 but was not voted in until 1975. His career numbers while good, but questionable at best - 369 career Home Runs, 1451 hits - Best MVP finish was 4th in 1949 (Jackie Robinson). He was a six time all-star who never played in the World Series. Kiner's did lead the NL in Home Runs during the first seven years of his career - very impressive - I can't imagine that it has ever been duplicated. In early December this card went for $5.50 at the PhillyShow in Valley Forge. This appears to be about as cheap as your likely to find the card. $7.95 is the lo-bay finish currently. 5 auctions finished under $10. The Highest closing auction was $85 for a card listed as PSA NM 7. Going back to last years Phungo Set for this card. On this weeks episode "the Office" they had a special guest star - Julius Erving. 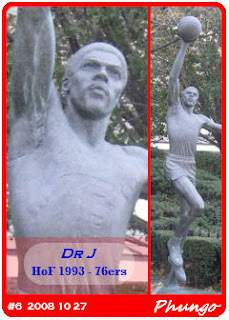 The Dr J statue used to be outside the old Spectrum. I am not sure where it is now. Creating a card from this photo presented a bit of a problem. To show the entire statue would leave a lot of dead space on each side of the card. I eventually decided to create a split card. There isa close up of Erving's upper Torso on the left. On the right one can see the full height of Dr J. I also shortened up the nameplate - thankfully Juilius Erving's nickname fits smaller area. For a look back at a more traditional 2012 Phungo Card check out the Harry Kalas card. I didn't quite make it thru all of the Phillies on the HoF Ballot, but I did want top get to this one. This card says a lot about this years ballot. It has one player who got a single vote in 2001 and another that remained on the ballot for his full 15 years of eligiblity. We have one player who was known as a good guy off the field and one guy who has had nothing but trouble since leaving baseball. This card also shows both sides of the steroid issue. 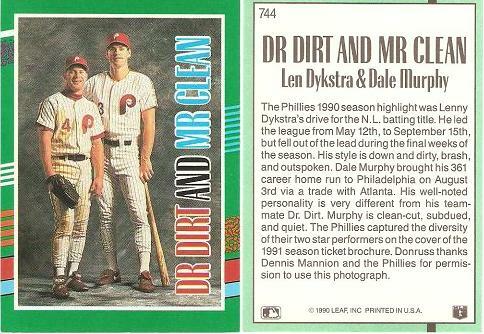 One guy we're pretty sure is Mr Clean and on the other side of the PED issue we have Dr Dirt. Looking forward to Wednesday's Results. My Apologies to the two Phillies Alums I didn't get to in the 2013 HoF candidates I didnt' get to - Julio Franco and Roberto Hernandez. I supposed I may get a crack at Mr Franco in 2014 - doubtful for Hernandez. This is a photo taken at the Orioles Opener back in April of last year. We had perfect weather and the O's beat the Twins 4-2. It was a great start to a fun season. 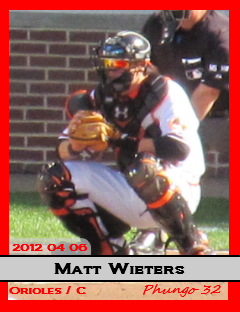 Wieters was 0-3 that day but did collect an RBI on a fielders choice ground out. Matt made his first all-star team in 2012 and has had respectable numbers in four big league seasons. The Phungo card features a decent pix from the left field stands - you can only get usable photos from that distance if your at a day game. It's not perfect but it is better then a lot of early 80s Fleer. The Card number is 32 which also happens to be Wieters uni number. In the bottom right you can see the team and position listed. You may notice that the photo extends below the player name. This gives me some options with different photo sizes. A lot of batting stance Photos I place the feet below the nameplate, while with catchers squatting I basically just use the upper square. It is a new year and everyone knows what that means - It's Phungo Card time!! It was tough to find the right guy to be the Phillies #1 card for the 2013 edition of Phungo Cards. There were few if any standouts for the 2012 Phillies. Carlos Ruiz had a great season but it was marred when his PED violation was revealed this fall. 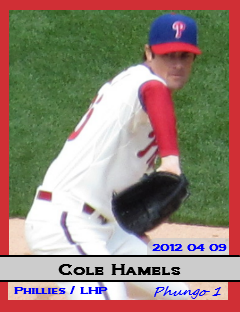 Ultimately Cole Hamels was the Phillies best player this past season. This earned him the #1 card in the 2013 Phuugo set. His qualifications including leading the Phillies talented pitching staff in Wins, ERA, Strikeouts, and Innings. I feel as though this years set is the best set we have ever produced. I really like the design - it is simple but sharp. The player name is prominent and the Photo is prominently featured. There are several items that have become standard on Phungo Cards - notably the specific player position and the date of the game that was being played. The Phungo Signature appears in the bottom right along with the card number. I realize the design is similar to 2000 Topps with the tab above the name echoing a similar element on the Topps card - I don't have a problem with that. 2000 Topps is a bit minimalist, but clean and that works for me. This years base set contains 70 cards - This is our largest set ever. 22 of the major leagues 30 teams are represented with most of the Photos being from within the last year.This is the 5th edition of Phungo cards which I have been producing since 2009. I think that I have finally created cards representing every team. In addition to the 70 base cards two insert sets returned there are 7 black framed inserts including our first blogger card. The Jackie Robinson Retired Number Continuity returns for the third year with three new retired numbers added. You will be seeing a lot of 2013 Phungo cards over the next few weeks. Let me know what you think of the design, photos, player selection or whatever other comments you may have.